There are cars and then there are blockbusters, the Toyota Innova is clearly the latter. Very few vehicles in India have had a successful run like this Toyota. 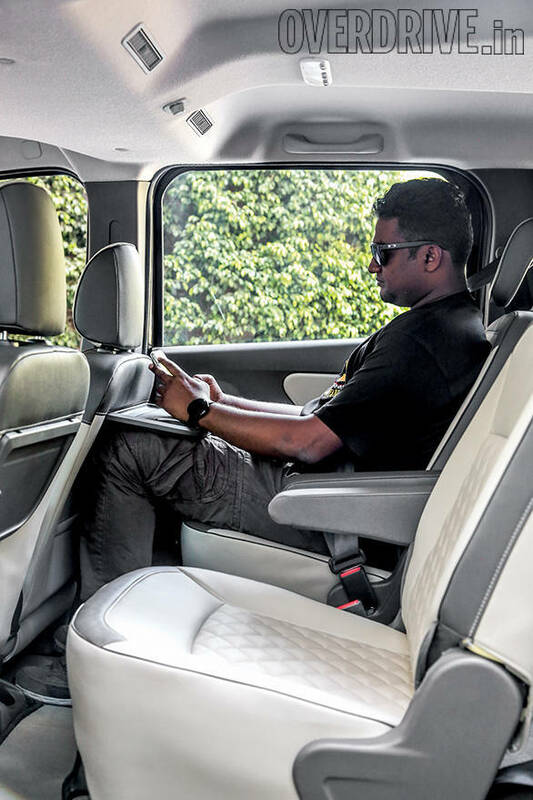 For the past decade, the MPV has been constantly selling in big numbers. Despite competition from various carmakers, none of them have been able to crack the code. The Innova is a solid work horse, there's no denying this. We've even seen this Toyota towing out a few rally cars from the rocky stages in the Raid de Himalaya. It's the first choice for large families and fleet operators. But as much as we like it we've also waited a really long time to see an Innova beater. Renault claims to have invented this body style almost three decades ago, but in India it has been busy selling an SUV. 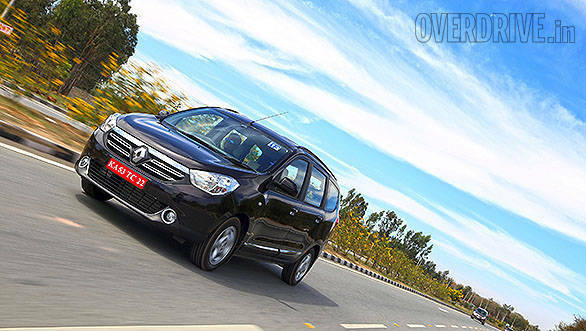 The French carmaker will launch the Lodgy, an MPV based on its bestseller, very soon in India. But, can it better the benchmark? An MPV is a practical vehicle. This means it has to be able to offer a lot of space and still look smart and not boxy. The Toyota Innova was one such vehicle when it went on sale a decade ago. It has aged well and the cosmetic updates have helped it look fresh over the years, at least when viewed head on. The rest of the vehicle, however, is more or less the same. The sides are flat and there aren't any major definition lines while the very familiar rear gets an added reflector that runs between the lamps. Then there are the dealer add-ons that include a lot of chrome accessories. The Renault Lodgy in comparison looks fresh. Of course, it is much newer but the overall design is a lot more appealing. The basic silhouette may be boxy but then the striking face and various lines on the body make the MPV quite likeable. The front end is dominated by an imposing grille that has been tweaked for India. The twin slats neatly sit around the large Renault logo. The Lodgy too gets an optional chrome pack but it comes straight from the factory. The chrome detailing, for instance, around the air dam and the fog lamps are only for our market. The bumper features a sharp chin like we see in a few Volkswagen cars. We quite like it. Move to the side and you will realise that the Lodgy is quite a long vehicle. At 4.5m, it's as long as the Innova. The sides are flat but to give it character, the front and rear fenders get some definition. 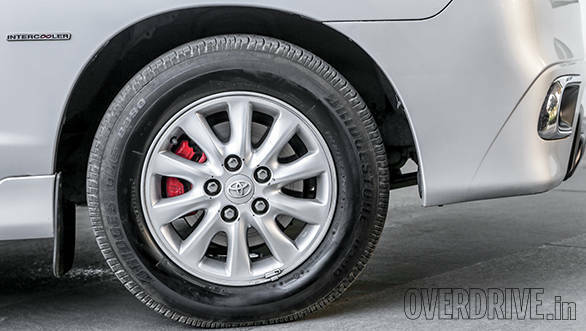 15-inch alloy wheels look smart and fill up the wheel arches quite nicely. The tail lamps wrap around the sides well and flow with the fender line. Speaking of the lamp, the uniquely shaped vertical unit with a hexagonal cluster is the only highlight of the plain rear end. Overall, the Renault is the better looking of the two. It's the same story inside as well, the basic layout and design in the Innova hasn't changed for a decade. It's a plain interior but the addition of a newer steering wheel with audio controls and a redesigned centre console finished in brushed aluminium improves the overall cabin feel. Renault seems to have learnt from its mistakes. The Lodgy unlike the first Duster, does feature a nicer interior. 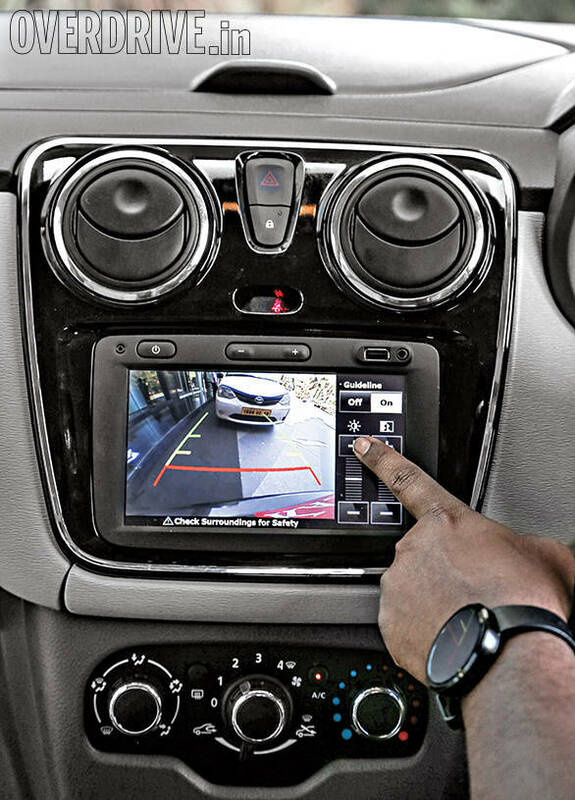 It uses parts from the updated version of its SUV like the steering wheel and the touchscreen unit etc. Quality of materials and overall fit are as good as the Toyota Innova too. In fact, it does feel a lot car like. The light brown/beige interior combo is easy on the eye and adds to the airy feel. 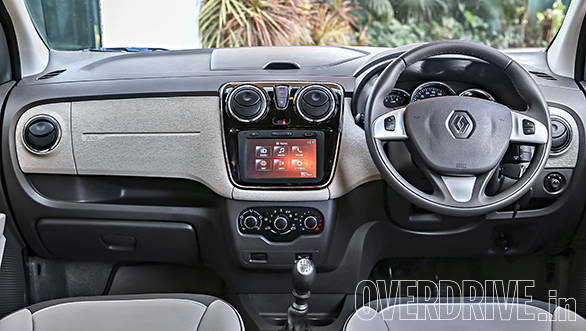 The steering wheel features cruise control switches and the audio and phone controls are housed behind the wheel similar to the, yes you guessed it - the Duster. Sit back to back in both the MPVs and you know that the Renault is a lot more current. 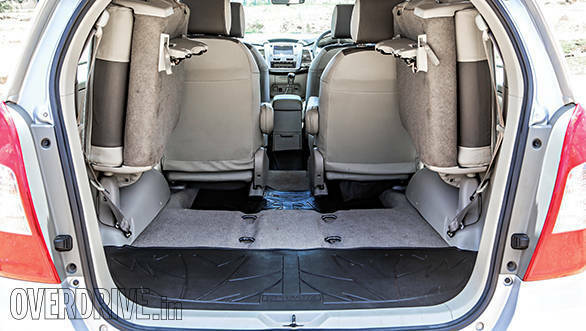 The Innova is known for its comfort and easily accommodates seven or eight adults depending on the seating arrangement. Renault too are offering the Lodgy in the same seat configurations and there is as much space on offer. At the front, both offer comfortable seats with good thigh and lumbar support. The Lodgy cushion did feel a bit more firm, making it ideal for long distance driving. Move to the middle seats and the Toyota does have a slight advantage. It is slightly wider and if you opt for the bench seats, three adults will find it more comfortable here than in the Renault. 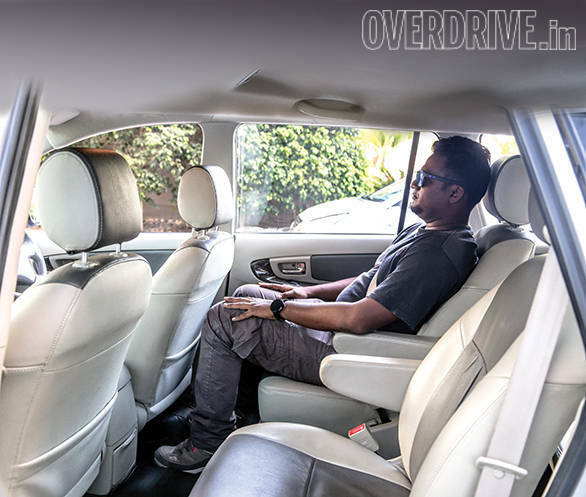 The captain seats, however, are as wide but could do with some more padding like in the Innova. 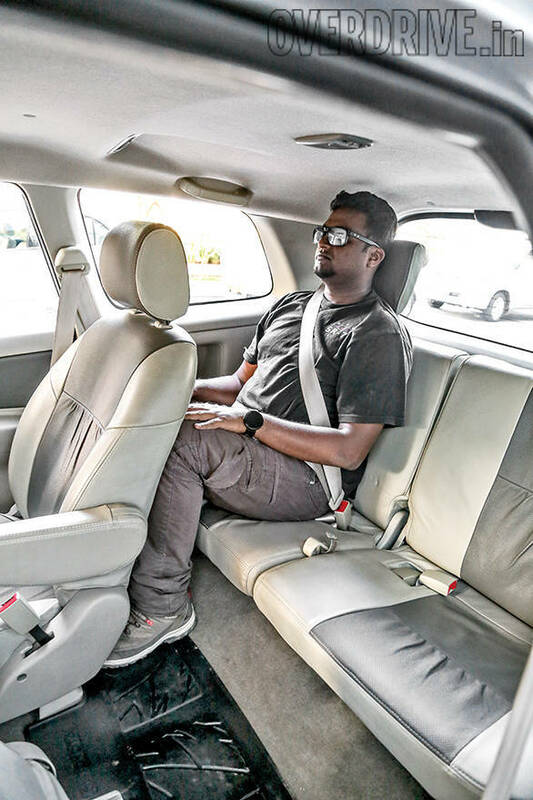 Rear knee-room, however, is slightly more in the Lodgy, the Innova can offer more only if the seats slide all the way to the back. But this means the third row passengers won't have much room. 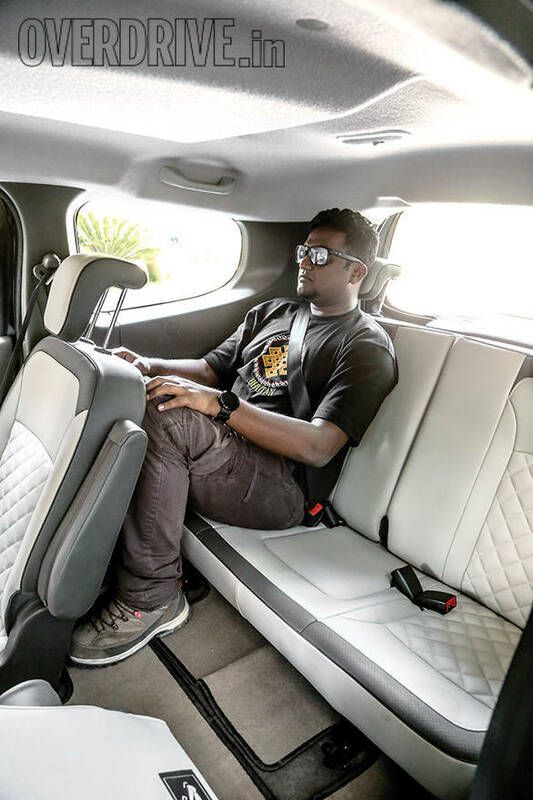 If there aren't any seated then the Toyota is the better MPV to be chauffeured in. The last rows in both are good to accommodate two adults comfortably but a higher floor in the Lodgy means one will have to sit with the knees pointing more upwards, not ideal for long durations then. Knee-room, however, is again better and getting in and out of the last row is easier since the Renault features tumble down seats in the middle. 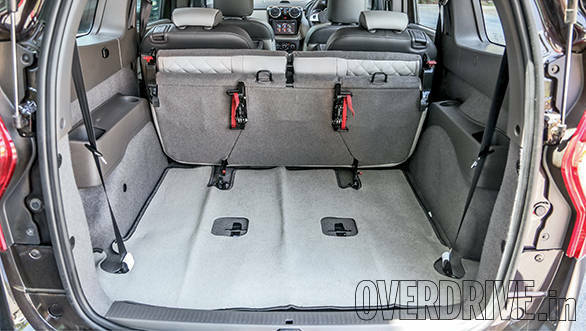 In terms of boot space, the Innova offers more space when all three seats are upright but then the third row can be completely removed in the Lodgy. So if there are five of you and you need more boot space, the bench can be left at home. Removing the seat is easy too. The seats also tumble down unlike the Innova's that need to be folded towards the window and tied down. The Renault can also offer van like cargo space if the last row is removed and the middle tumbled down. Storage spaces are plenty on both, while the Innova gets a lot of storage under the armrest (my old iPad fit in there), the Lodgy gets as much space on the top of the dash. Holders in the door pads can accommodate large bottles while the third row passengers also get arm rests with cup holders. 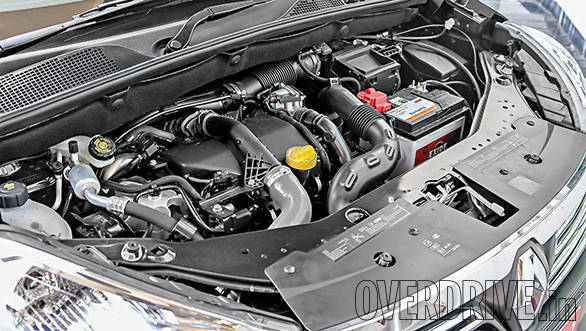 While the Toyota Innova uses the proven 2.5-litre motor, the Renault Lodgy is powered by the same 1.5-litre K9K motor seen in various vehicles in India today. The are two states of tune (85PS and 110PS) available like in the Duster. We compared the more powerful variant against the Toyota. 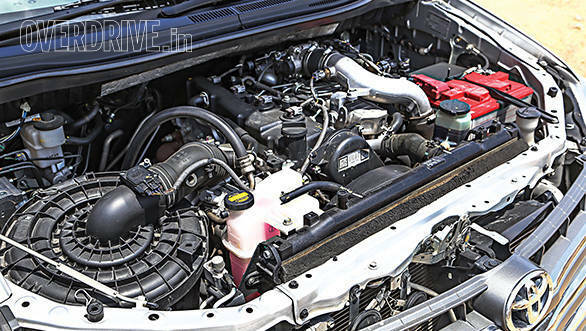 On paper, the Innova should have an advantage but it's the Lodgy that produces more power and higher torque. The D-4D produces a max power of 102PS and max torque of 200Nm between 1,200rpm and 3,600rpm while the dCi engine puts out more power and higher torque too (110PS and 245Nm at 1,750rpm). It is a lot more refined than the Toyota and power delivery is better too. Out on the road, it feels a lot more eager and the throttle response is sharper. 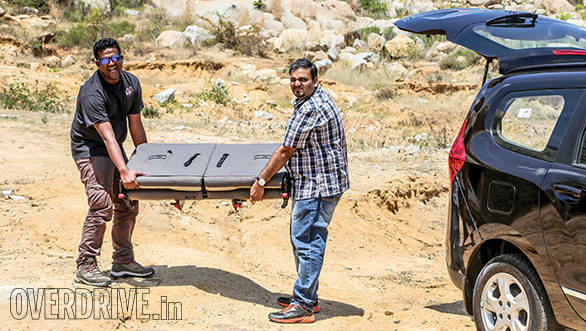 The clutch action isn't as heavy as the Innova's. Driving around town was a lot more effortless in the Lodgy. 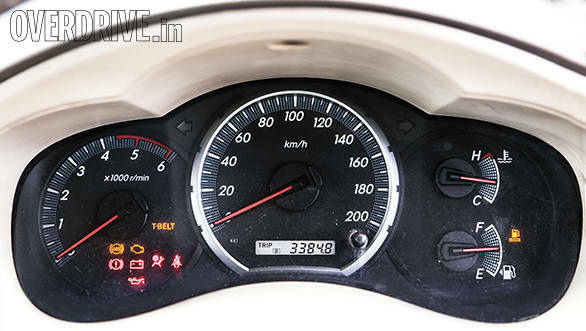 The 6-speed gearbox makes full use of all the power and the ratios are better spread out than the Innova's 5-speed unit. The gearbox does feel notchy to operate but the gears slot well. The long throw gearbox in the Innova feels very utilitarian and the stick vibrates even during idle. Even out on the highway, the Lodgy drives better. The motor cruises at triple digit speeds without much strain and unlike the Toyota, the engine isn't noisy. 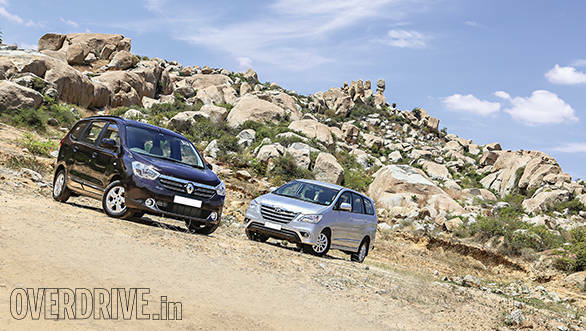 The Lodgy is quicker too, thanks to a lower kerb weight (1,368kg), 100kmph comes up in 13 seconds and the top speed is an impressive 165kmph while the heavier Innova (1,700kg) crosses 100kmph in 17.6 seconds and cannot go past 151kmph. In terms of fuel efficiency, the smaller and modern Renault motor offers more to the litre. In town, the Lodgy returns 12.3kmpl and 21.6kmpl on the highway translating to an overall efficiency of 14.6kmpl. The Innova in the same conditions offers 10.1kmpl and 16.2kmpl respectively while the overall figure is a lower 11.8kmpl. 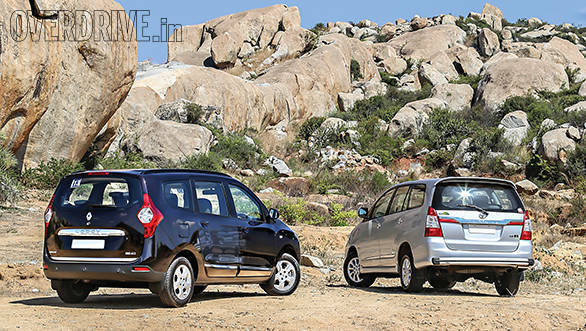 The Lodgy is clearly more efficient by a big margin and offers a higher driving range too. 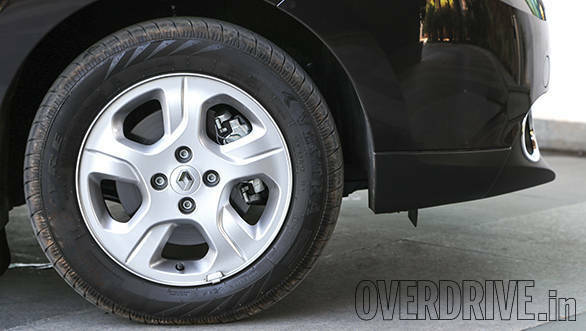 The Toyota Innova and Renault Lodgy feature different suspension setups. The Toyota uses a double wishbone up front and a four-link suspension at the rear. The Renault however, features a MacPherson strut at the front and a torsion-beam rear suspension. While the Innova offers a good ride, the Lodgy isn't far behind. Just like its SUV sibling, it drives easily over broken roads, bumps and undulations. But passengers seated in the third row will find the ride to be more bumpy in the Renault. Overall, ride quality is definitely a USP for both the MPVs. There's a stark contrast when it comes to handling though, the Lodgy is a lot more agile thanks to a monocoque chassis and lighter kerb weight. The heavyweight Innova uses a ladder frame. This and the higher centre of gravity means there is more body roll displayed. The Toyota is better suited for straight line driving and is no match for the Renault when it comes to dynamics. The Lodgy is more confidence inspiring to drive, it holds its line well around corners and the steering offers better feedback and is more direct. Even the driving position is more car like and is a definite plus point. Brake feel in the Innova is better but it takes a longer time and distance to come to an halt when compared to the Lodgy. The top variants on both offer standard safety features such as ABS and airbags for driver and passenger. 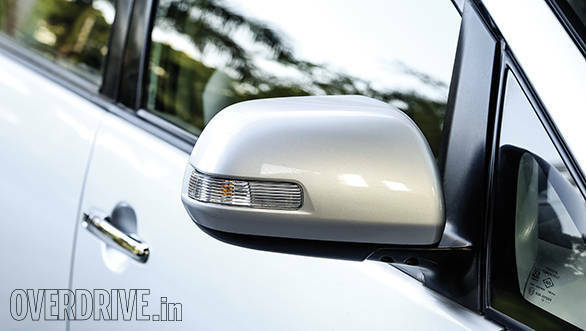 The Renault additionally offers EBD and an impact sensing auto door unlock feature. There is a long list of comfort features too. 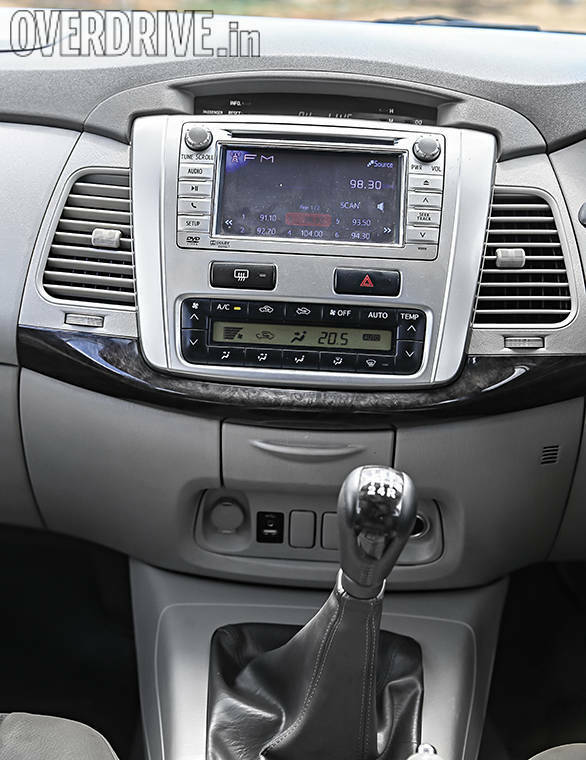 The Innova and Lodgy offer air-con vents for all three rows, touchscreen stereo with a reverse camera function, steering mounted audio/phone controls, trip computer, keyless entry and a rear wiper with defogger. 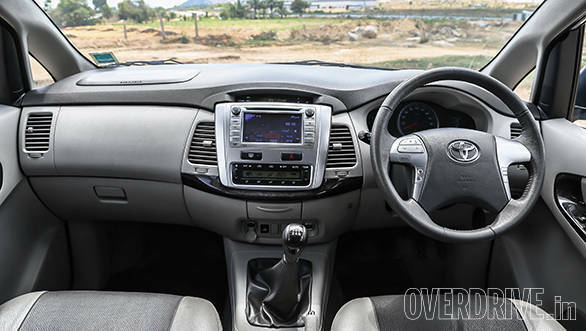 The Innova features automatic climate control but the Lodgy gets cruise control with a speed limiter and power sockets for all three rows as standard. 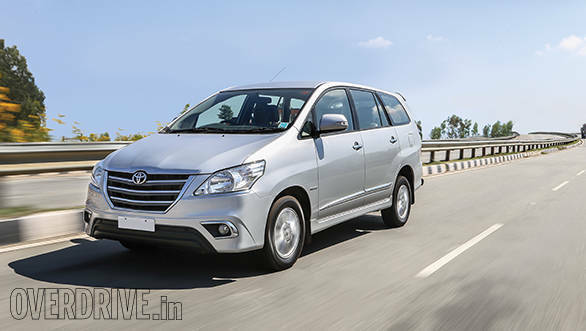 The Toyota Innova has ruled the MPV segment for a decade and as we've said before, there hasn't been a worthy competitor so far. But after driving both the vehicles back to back, we can't help but say this - the Toyota despite being one of the most premium MPVs around is starting to feel utilitarian. The Renault Lodgy becomes the first MPV that has bettered the Toyota in many aspects and comes across as a very good package. It is better looking, more powerful and efficient, offers more features and is as spacious. The Innova, however, is still a strong package and it is not going to be easy contending with its strong after sales service, market penetration and the worshippers of its reliability. This is the reason why families and fleet operators don't mind paying the extra premium despite a 50 per cent increase in price over the years. But at the same time, the Duster and Logan have also shown that Renault makes cars that are reliable and low on maintenance. The Lodgy is expected to be priced between Rs 9 and 13 lakh and at this price, it should undercut the Innova by almost three lakhs across variants. This makes the Lodgy a potential winner in the Indian MPV segment and should be enough incentive for buyers to give this MPV a serious look.